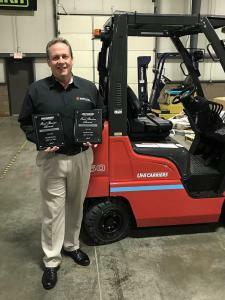 GREENSBORO, NORTH CAROLINA, UNITED STATES, November 27, 2018 /EINPresswire.com/ -- North Carolina based forklift dealer, Tri-Lift NC Inc, has been recognized by UniCarriers Americas Corporation for outstanding performance across their entire dealer footprint. Tri-Lift NC Inc is a 3rd generation family owned and operated business specializing in industrial/warehouse equipment and a variety of other material handling focused solutions. Tri-Lift NC Inc represents multiple brands of forklift equipment and has earned awards from all represented manufacturers in the past. The most recent awards earned by Tri-Lift NC Inc come from UniCarriers Americas Corporation for being a “Goal Buster” in all forklift equipment classes as well as meeting and surpassing Parts sales goals in 2017.